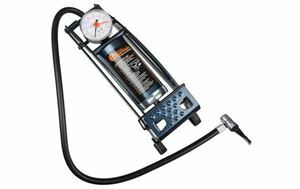 What tyre inflators can I buy from Halfords? A workshop should be equipped for any eventuality, and there’s no point in keeping an well looked after car if you can’t set the tyre pressures before setting. 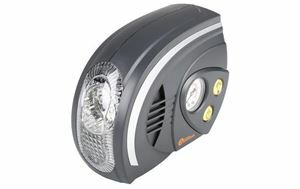 Here are a selection of handy inflators and workshop-spec mini compressors from Halfords. Covering off the budget end of the market with this perfectly-priced offering, this Halfords Essentials foot pump can get you out of a sticky situation with the minimum of fuss. The bold and clear analogue gauge will keep you informed with a thumb-lock on the end of the air line to ensure secure inflation and an adjustable red needle so you can avoid overinflation. With a sturdy metal frame and tough painted finish it should last too. 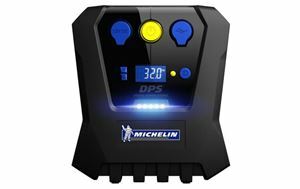 Currently reduced to a tidy £40 this digital tyre inflator from Michelin not only looks futuristic but is equipped for modern life. Plugging into your car’s 12V socket it can inflate a flat tyre to 35PSI in three minutes and can go up at high as 50PSI, and the automatic operation means you can switch on and forget about it. As a bonus, there is another 12V socket to feed other devices plus a USB socket to charge phones, which could be a lifesaver. Another offering from the Halfords Essentials range, this delivers the basics you want from a powered inflation system with some things you might not expect. 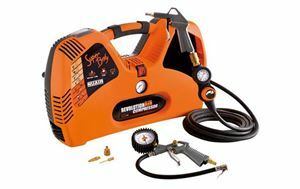 Hooked up to a 12V supply it delivers up to 20 litres of air per minute, allowing it to inflate a flat tyre in around six minutes. The analogue gauge gives readings in PSI and BAR, plus there are a range of adaptors and an LED light to illuminate dark conditions. 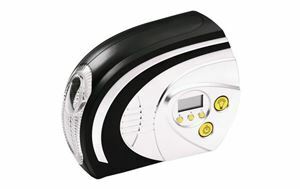 Halford’s own-branded tyre inflator has clearly learned a thing or two from the competition, packing in all the key features at a reasonable price. Dishing out up to 120PSI and as much as 30 litres of air a minute means it can tackle a flat tyre in under three minutes, with a digital display and automatic operation making it easy to set up and control. It’s also fitted with a torch for nighttime operations and still weighs under 1kg. 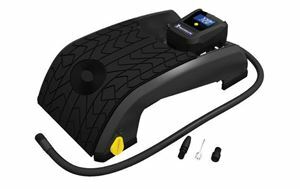 An unusual mix of analogue input and digital output, this foot pump from Michelin has a twin-chamber design to maximise the amount of air for each press of your foot but combines it with a digital readout to ensure accuracy, in PSI, BAR or kPa. The broad footplate helps to minimise slippage with a steel frame underneath for strength.